If this project sounds familiar, you might remember the outcry a few years back when the plan was first floated. The original idea included consolidating eastbound bus stops into a single stop along the stretch of Washington Ave near the Iron Gate Cafe. The restaurants owners were concerned how the multi-bus stop would affect their business, including the cafe's popular outdoor patio that borders the sidewalk. There was a petition. And a response petition. There were some heated discussions. And the plan was changed. 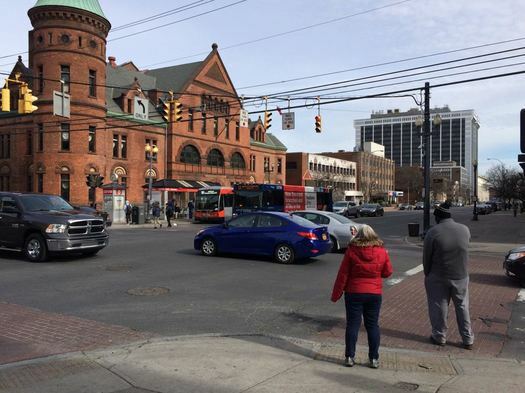 "It's mainly a project to improve primarily safety at the Lark and Washington intersection," Ross Farrell, CDTA's director of planning, said. "If you know the area well it doesn't function as perfectly as it could." One of the big complications in the current configuration is that some of the bus stops -- like the one for westbound buses on Lark Street in front of Kinaree, near Spring Street -- just don't have much space for people to stand. So there's a crunch for sidewalk room when during peak times, with people standing close to the curb. The current setup for westbound buses also prompts some routes to make a sort of zigzag out of their way up Central Ave even if they're headed west on Western or Washington because they don't have enough room to get over into the appropriate lane. 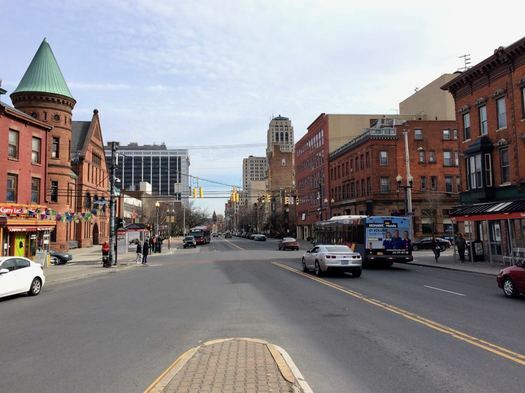 + The stops for westbound routes -- that is, buses headed up Washington Ave out of downtown -- in front of the Washington Ave Armory and around the corner on Lark Street will be removed and consolidated into one stop in front of the Albany Public Library. That stop will have a curb cutout (a "bus bay") allowing four buses to stand there at a time. There will be a BusPlus shelter. + Just west of the stop there will be a new mid-block crosswalk with a traffic signal. "Right now that block is extremely wide. And if you're out in the middle of the day, a lot of people are crossing mid block," Farrell told us while describing the plan. 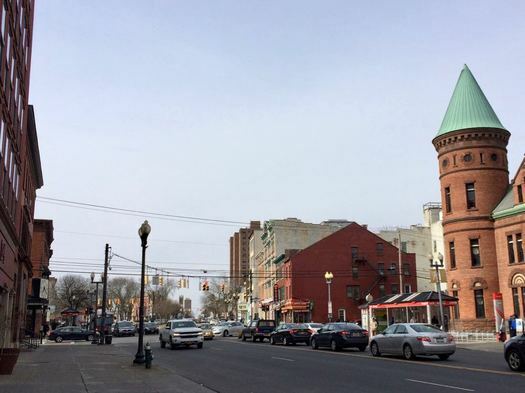 The signal will eventually be timed with the Lark Street intersection signal to stop traffic from turning into the crosswalk while people are crossing. + That mid-block signal and the bus bay will also serve as a queue jump for buses. That is, buses will get the green light sooner than other traffic, allowing the buses to get a head start going west. The idea to help avoid conflicts as buses try to pull out of the stop. 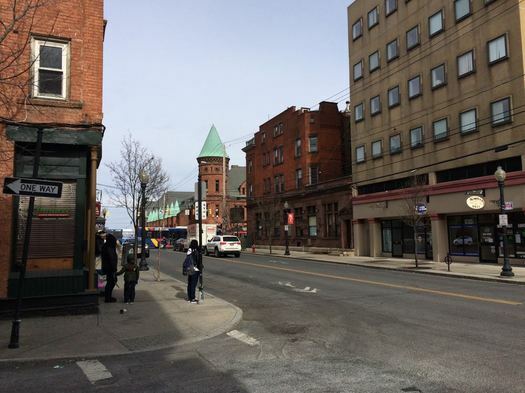 The queue jump will also be a precursor to the system planned to allow BusPlus buses -- CDTA's bus rapid transit -- to move along the corridor more quickly. + Westbound Washington Ave is getting a turn-only lane for Lark Street. + Curb bumpouts at Washington and Dove and other spots along that stretch the shorten the distances for crossing pedestrians. + The eastbound bus stops -- on Washington just before Lark, and Lark just before Washington -- stay the same. There will be no consolidated stop on the south side of Washington Ave. Said Jaime Watson, a spokesperson for CDTA, in reference to the back-and-forth over the original plan for a consolidated stop there: "We're glad we were able to come up with a plan that worked for our customers and worked for the businesses along that corrdor." The total cost for the project is $1.3 million -- about 60 percent of that is coming from state funding, the rest from federal money. CDTA's Ross Farrell said construction is scheduled to start this summer and wrap up by late fall. So, it's basically the same plan, except they scrapped the Eastbound improvements so as not to inconvenience one business. Everybody's happy? Disappointed that cdta and the city are capitulating to the nimby demands of a single restaurant. We live in a city, transit should be near the top of the priority list. I am very glad they are moving the bus stop back from the Armory to the Library. The number of near misses from folks turning onto Washington Ave is frightening. I am also happy to hear a mid-block crossing is being installed. There are waaaaay to many people walking down the middle of a 4 lane road not paying attention, hopefully this will give them a safer, faster, path to the other side. 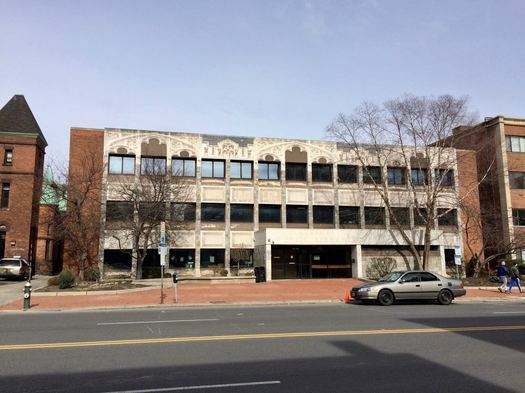 @Blech/Mike: considering the truly ludicrous nimby attitudes on display in other city neighborhoods, particularly center square, it seems bizarre to go after one business for something that has been resolved. the new plan looks fine. I agree with Mike on this 100% the Eastbound Lark St. stop should have been moved down the block in the same manner as the Westbound stop. This will just create more problems with people crossing in the middle of the street to transfer buses and clog up the corner at Lark St., and all because a business owner, basically said only poor people take the bus and I don't want them in front of my place. It's pretty clear who this administration cares about (I suspect CDTA got bullied into this) and it's not the 1000s of us who ride CDTA. The new CDTA layout is overall an improvement. Washington/Lark corner is dead and hopefully the layout will bring new businesses back to the area and improve patrons of restaurants like Kinnaree. Iron Gate has a point---a birrage of people outside your restaurant is suboptimal unless you are a convenience stand. Overall, Center Square needs more parking! This will help businesses on Lark thrive. Agree with all that they should have done it for both sides, but this is certainly an improvement for pedestrian safety. A bigger bus stop in front of Iron Gate isn't as necessary as a consolidated bus stop across the street. I don't even think that it's really necessary at all. It wouldn't solve any of the problems raised in this article--which it looks like this plan does (gets rid of the crowded Kinnaree stop, allows the 10-Western and the 12-Washington to actually get to Western and Washington without zig-zagging around, and eliminates the confusion I see people experience all the time when the 13 or the 18 flies past Lark Station to turn left on Lark leaving them behind. All the buses heading downtown on Washington just continue all on the same path straight down Washington from Lark. The westbound buses go in at least four different directions (Lark, Western, Washington, Central). It's way more confusing and convoluted heading west right now. The only advantage I can see to adding a big bus stop in front of Iron Gate is that during rush hour the eastbound Lark Station occasionally gets backed up for the time it takes to get through one red light. That seems like a fair price to pay to maintain a nice atmosphere in front of a restaurant that prides itself on its great outdoor dining. I like this plan as it is. Didn't CDTA propose the eastbound stop for a building or two over from Iron Gate, not in front of it as Asher G claims? With the exception of tirades by die-hard fans of 45, the comments by the audience at the CDTA public meeting for the proposed midblock stop were the saddest and most infuriating hate spew I've heard. I don't think I've ever been more disappointed in my city. Thinly-veiled classist and racist at best. "Let's say I have to move," shouted one protesting tenant. "Where am I supposed to park my truck? Put my couch!" I'll shout down a plan that improves safety, reliability, and efficiency of an entire transit network because I MIGHT be inconvenienced someday by an extra 30ft. walk with a couch. We live in a city. We need to start acting like it. THIS why we can't have nice things. While I understand the topic at hand is the location of bus stops, I'm a bit more concerned about the story my son shared with me last evening about his experience while waiting for the bus yesterday morning. He was essentially trapped in the bus shelter as two men got into an altercation which involved a woman, a large walking stick and perhaps, in my son's opinion, alcohol. Visibility and passenger safety/security should not be overlooked in the improvements.